Nylon 54 Inches Black Web Belt w Black Buckle 54 inch long and 1.25 inches wide. The nylon belt is sleek and gives complete look. 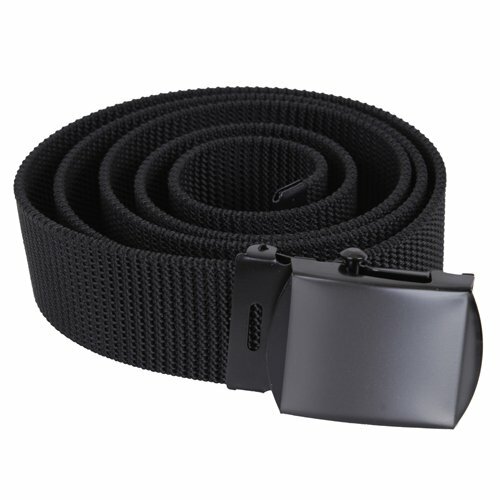 Made of good quality nylon material, the belt is extremely durable. It looks stylish and trendy. As it is of good quality it last for years. It goes well with any outfit. It fits right, so it adds elegance to your outfit as well as your personality. It is unisex. Black colored nylon belt with black color buckle makes it more attractive. It is fully adjustable with buckle with black colored tip.